John Schlesinger’s extraordinary career in cinema, stage, opera, and television spanned half a century. It was, however, his films that made him famous, including such classics as Midnight Cowboy, Sunday Bloody Sunday, Marathon Man, Billy Liar, Darling, and Day of the Locust. 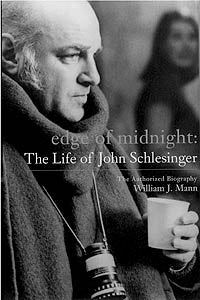 In Edge of Midnight, William J. Mann chronicles Schlesinger’s life and career from his early documentary days at the BBC to his emergence as part of the New Wave of British film in the 1960s (along with Lindsay Anderson, Karel Reisz, and Tony Richardson), to his Academy Award for the X-rated Midnight Cowboy, to his glittering nights as a Hollywood host, and finally to his death on July 24, 2003, brought on by a massive stroke two years earlier. In writing this biography, Mann received the full cooperation of Schlesinger himself, as well as that of his family and his companion of 36 years, Michael Childers. In addition, he was granted complete access to tapes, diaries, production notes, and correspondence. Many of Schlesinger’s actors, crew members, friends, and colleagues shared their thoughts and memories, including Eileen Atkins, the late Sir Alan Bates, Alan Bennett, Julie Christie, Sir Tom Courtney, Placido Domingo, Robert Evans, Sally Field, Melanie Griffith, Sir Peter Hall, Ed Harris, Dustin Hoffman. Shirley MacLaine, Ali McGraw, Sir Ian McKellen, Lynn Redgrave, Vanessa Redgrave, Nicolas Roeg, Isabella Rossellini, Roy Scheider, Martin Sheen, Kiefer Sutherland, Dame Kiri Te Kanawa, Lily Tomlin, Brenda Vaccaro, Jon Voight, Robert Wagner, Billy Williams, Michael York, and Franco Zeffirelli. William J Mann © 2019. All Rights Reserved.